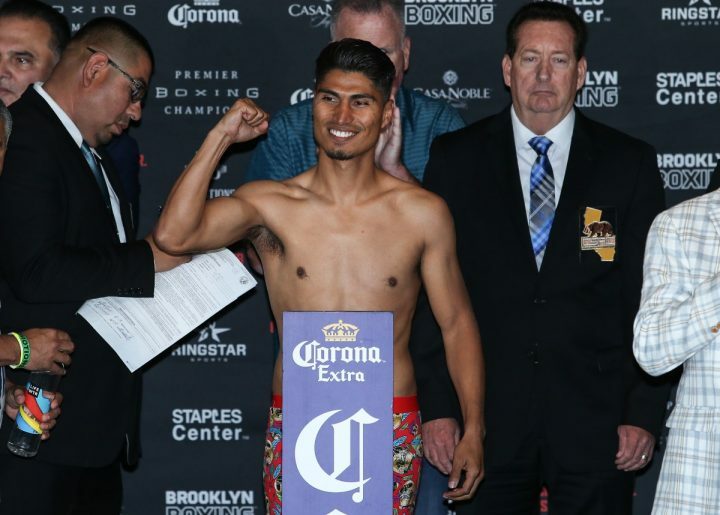 By Dan Ambrose: Mikey Garcia’s trainer Robert Garcia is predicting a knockout victory for him over Errol Spence Jr. on March 16 when the two of them meet up in their big fight at the AT&T Stadium in Arlington, Texas. Robert says Mikey has seen something in Spence’s game that makes him believe that he’s going to beat him by a knockout in their fight on FOX Sports PPV in two months from now. Robert’s knockout prediction could be seen as an attempt to try and get as many people as possible to order the Spence-Garcia on PPV. The more people that purchase the fight, the more money Mikey will make. Unfortunately for Mikey, he’s seen as having zero chance of causing the upset. Mikey is moving up two weight classes from lightweight to welterweight to take on a fighter that is looking invincible right now in 28-year-old Spence. It would have sounded more believable if Robert had simply predicted that Mikey will win by a close decision. That’s something that the boxing world could buy into. It passes the laugh test much better than a smiling Robert Garcia saying that Mikey is going to KO Spence. If Mikey had proven that he can knockout other welterweights like Danny Garcia or Shawn Porter, then what Robert says about him potentially knocking out the 28-year-old Spence would be seen as possible. As of right now, no one believes that Mikey is going to be able to KO Spence or any of the other champions at 147. Welterweight belt holders Manny Pacquiao, Keith Thurman, Terence Crawford and Shawn Porter would give Mikey serious problems, and likely beat him. Mikey is older, smaller, weaker and has no experience at 147 like Spence. Robert can make all the bold predictions that he wants about the fight, but the reality it, Mikey is up against a rock and a hard place in taking on Spence. It’s a terrible mismatch on paper, as Mikey didn’t even look good in beating Sergey Lipinets last year. Mikey took a pounding from Lipinets and appeared to win by a very margin. The judges gave Mikey, the A-side in the fight, a wide decision (116-111, 117-110 and 117-110, but he didn’t deserve those scores in the view of this writer. Mikey just barely won the fight over Lipinets, and he looked terribly weak in comparison. Unless the tiny 5’6″ Mikey can find some punching power by March 16, he’s going to likely get chopped down by the much taller, and stronger 5’9 1/2″ Spence on the night. Mikey is currently the underdog though, so he’s going to need to prove the odds-makers and the boxing media wrong. Mikey is seen as the underdog pretty much by everybody. Robert Garcia has a history of stopping fights when his fighters start to get worked over. Some feel that Robert will have his white towel ready to toss into the ring at the first sign of trouble for Mikey on March 16 against Spence. It wouldn’t be the first time that Robert stopped one of Mikey’s fights when things started going badly for him. Robert had Mikey’s fight against Orlando Salido halted after he started to take punishment in the seventh and eighth rounds. Mikey’s broken nose was the excuse by Robert to have the fight stopped, but some boxing fans believe that he had the fight stopped because Garcia was starting to get hit a lot, and looked stressed. The fight then went to scorecards, and Mikey was given an 8th round technical decision victory. “Low blow, whatever it is. We’re going to stop him,” Robert said in making it clear that Mikey is willing to do anything to try and beat Spence. “He’s [Mikey] going to beat him, really. We’re taking four to one [odds]. Mikey told me, ‘For the first time, I want to be the underdog. I want people not to give me a chance,'” Robert said. You have to throw out throw out the window all Mikey’s previous wins as a pro, and see this fight as a situation where he’s 0-0, fighting a seasoned pro. None of Mikey’s previous wins as a pro mean anything in preparing him for what he’s going to be facing when he gets inside the ring with Spence. Past Mikey opponents like Salido, Robert Easter Jr., Dejan Zlaticanin, Elio Rojas, Adrien Broner and Juan Carlos Burgos would be food for him. Those would not be competitive fights due to the size difference between them and Spence. It would be in Mikey’s best interest to try and box Spence like he did in his win over Lipinets last year. Mikey knew better than to slug with Lipinets. Mikey chose to box Lipinets, and play it safe. Even in focusing on just boxing, Mikey took a real beating from Lipinets, and wound up looking like the loser in the fight. If Mikey wants to go out on his shield, then he should follow Robert’s plan of going for a knockout. But it would be a foolish mistake on his part to try and mix it up with Spence at all in this fight on March. Mikey will end up punch drunk if he trades with Spence in the early rounds, and that’ll put him at the mercy of the Texas fighter. Mikey’s last opponent Robert Easter Jr. was hitting him a lot in their fight last July at the Staples Center in Los Angeles, California. If Spence is able to connect with as many shots as Easter Jr. did, then Mikey is going to need to have a steel chin to take all those big shots. Spence hits a lot harder than Easter, and he’s a much better body puncher than he is. Mikey has never fought anyone that targeted his midsection the way that Spence will b doing in this fight. With Mikey’s popularity, he might get lucky and be given a controversial decision if he goes the full 12 rounds against Spence. If we see the same kind of scoring that Mikey had in his fight against Lipinets, he could be dominated by Spence and still wind up winning the fight if it goes the distance. If nothing else, it would be a moral victory for Mikey to go the 12 round distance to show the boxing fans that he was tough enough to go 12 rounds with Errol. Mikey and Robert could then tell the fans that they felt they were robbed. It would, of course, make them look like poor losers, but enough of the boxing public would buy into it for them to escape with their dignity intact. It would still look bad if they take that approach. What is more likely is for Robert to throw in the towel to pull Mikey out of the fight due to an injury of some sort like we saw in his fight with Salido in 2013. If Mikey has a small at the time, then he could win a technical decision like he did in the Salido fight.